Nippon is (rightfully) known as the country of politeness. 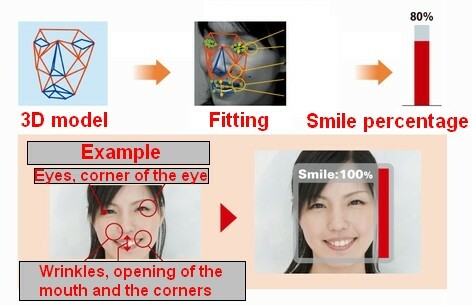 In order to uphold that status through scientific means, Japanese tech powerhouse Omron has developed the Smile Scan [JP]. The device, which consists of a small analogue video camera, a sensor unit and a piece of software, is only available in Japan at this point. Omron says it’s the perfect solution for employers to let staff train how to smile properly. Examples include people working in the service industry like receptionists or store clerks, operators in call centers but also sick people who can use the Smile Scan for rehabilitation. The device scans a person’s face, renders a 3D model of it and checks a few critical spots (mouth, eyes etc.) to evaluate if someone is smiling hard enough. Every smile gets a percentage from 0% to 100%, with 100% obviously being the perfect smile (see the picture above). Omron says up to two persons can be scanned at the same time. There is even a battle mode in which two persons can determine whose smile is better on a single screen. Omron also points out that the Smile Scan can be used with people outside Japan as well so don’t be too surprised if you see that thing somewhere near your work place soon. Watch the Smile Scan in action below.